Hi Pinners! Did you know that Pinterest is searchable? And searchable by source, too. 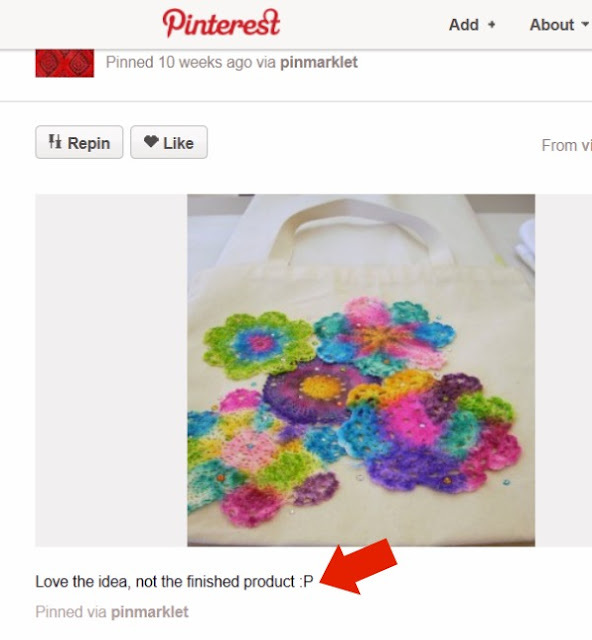 As a blogger, all I have to do is go to http://www.pinterest.com/source/craftsnark.com and I'll see all the pins from this blog. And the comments that go along with the pins. Especially the snarky ones. And I'm not the only blogger who knows this... it isn't exactly a State Secret. In celebration of all the snarky pinners out there, I'm starting this new Sunday Series "I Can See Your Pin." Sharing the not-so-private comments of pinners who don't realize that their pin is showing. This pinner has the backhanded compliment down. See the finished product here. Want to submit a pin you've seen, and the corresponding comment? Send an e-mail to Craft Snark! Not only has she mastered the backhanded compliment, she seems to have a wee bit of a superiority complex... I wonder if she actually tried this? I would love to see how much better hers would obviously turn out. I was clueless that pin comments also showed up but as long as my boards keep showing up, I guess that is the best outcome of a backhanded compliment. Wow, I totally did not know this, I just checked my blog on pinterest and I could not believe all the pis, now I'm off to loo for snarky comments. I just found your blog tonight (from Pinterest BTW)and I have been reading backward from the most current post. You are a riot! Love it! Thanks for the fun!